With 80% novice participants, navigation and driving issues were only to be expected during the Prologue of the 2018 "Aicha des Gazelles", a marathonrally for women only which started yesterday (March 21st) with Prologue in Morocco (after a inside-competition liaison from Nice/France since last Sunday). The first teams reached the bivouac at 5:30 p.m. after a 2:30 start. Most of the competitors experienced some difficulty: Reading the maps and the terrain is no easy task, even on a leg with no particular challenges. Although... In e-Gazelle Class, Kiera Chaplin / Jazmin Grimaldi committed a common error: Seeing a flag in the distance, they drove to it without checking their heading. It was a checkpoint on a different route. Not realizing their mistake, they headed north-north-west into terrain too difficult for an electric vehicle, resulting in a call for mechanical assistance. They were far from the only ones: Alexandrine Andre / Amandine Viroulaud, Julie Oudina Blaise / Meredith Grosset, Martine Dupessey / Carole Dupessey, Nadine da Cruz / Laetitia Barros Teixeira, Marie Helene Braud / Anne Laval, Marie-Laure Pondevy / Nathalie Casanova and Natacha Bordry / Clothilde Hamoin also required mechanical assistance after getting stuck in patches of sand that more experienced participants would find insignificant. At 7:30 p.m., as night and the temperature fell, the number of calls accelerated. But that is the point of the Prologue: To gain experience with navigation, driving, the art of getting the vehicle out of the sand. That was a lesson learned by Florence Beaulieu / Agnès Janin. "We only did one checkpoint and then decided to head back to the bivouac, but at least we got to try all our tools. 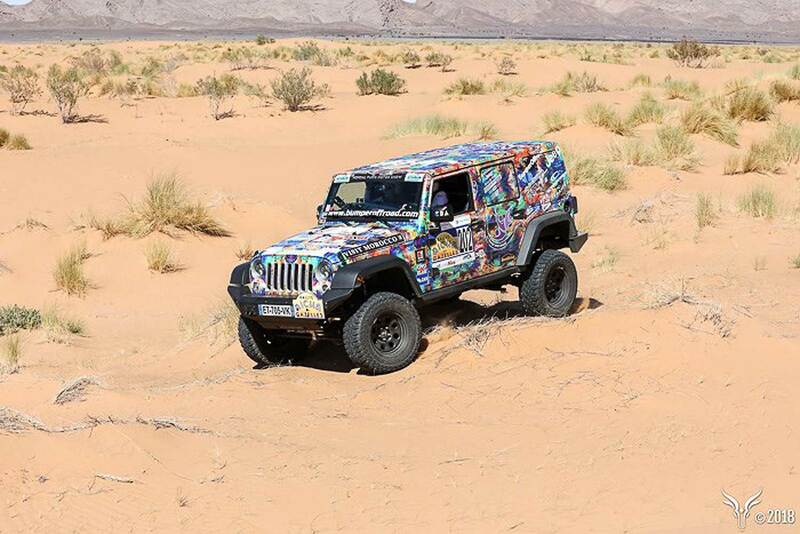 We’ve never been to the desert before and it’s hard to match what you see on the terrain with the features on the maps." Elisabeth Roux / Alexandra Rozlozny had the same impression. "We were so thrilled to reach the first checkpoint that we misread the terrain. We didn’t notice that it was a type of terrain that out vehicle can’t handle. So we ended up needing mechanical assistance. We would never have made that mistake if we’d stayed focused. It’ll teach us a lesson." Unsurprisingly, the teams Brigitte Sobanski-Joyeux / Patricia Capdevielle, Delphine Bichoffe / Christine Hunka, Carole Montillet / Sylvie Godeau, Veronika Grabher / Céline Vega Roiatti and Jeanette James / Emmanuelle Tarquini dos Santos, who have done an impressive number of Rallies between them, are already performing well. With an ideal distance of only 44 km, the leg should have been over by the end of the afternoon. The competitors should have been back at the bivouac, swapping adventures in the bar tent. But that was not to be: At 7:30, there were still 47 teams out on the terrain. And the weather conditions at the end of the day did not encourage relaxation: A strong wind over the bivouac chased everyone into the restaurant or to the relative comfort of their tents for as restful a night’s sleep as possible. It was a somewhat extreme initiation for many of the novices, but adventure is adventure – and that is what they are here for! Gaëlle of Team Voide / Dumause was all smiles. She found all kinds of checkpoints, including several that were not on her route, she laughed, hugging herself to stay warm. "We’re here to enjoy ourselves, and we haven’t been disappointed! And we still have our tents to put up. This is the first time I’ve gone camping in my life. I’ve been practicing folding my tent twice a week." Being a Gazelle requires many skills, including the ability to laugh at the day’s misadventures!